Some oil stiffened Crisps feature a far too brittle and hard crunch, but that is always preferable to the soft munch of pulpy regular Crisps. These Crisps however, met the task just about bang in the middle. There was a great crunch with a perfectly paced diminishing return munch from first bite to last. Most of the Crisps in the bag were irregularly shaped. There was skin on most edges. The oil boils were present and correct, and the soft yellow of the Crisps had a certain amount of slightly darker seasoning spread around. A Nose Plunge Test failed to give much away. The taste was fortunately a little more rewarding. The Mustard aspect balanced well with a porky Sausage taste, which was perhaps somewhat surprising. In the Potato Chips and Crisps world Sausage is a little more difficult to master than Mustard. 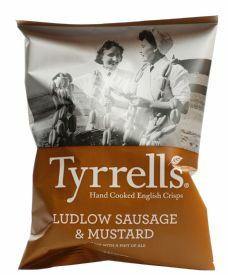 Wasabi and Horseradish are staples for Crisps manufacturers but blending Sausage with Mustard and not allowing one to dominate is a great credit to Tyrrell’s.